Features: Cooling capacity (BTU): 7,500 (approximately 250 square feet). Advanced technology exhausts humidity so there is no need to empty a water condensation bucket. Operates on air alone and requires no water to cool. Features an antibacterial filter that collects dust particles and prevents bacteria build-up. Energy Efficiency Rating (EER): 8.4. Air flow (CFM): 212. Built in dehumidifyer (Pints per day): 45.67. 24 Hour programmable timer with bypass option and adjustable thermostat provide variable cooling when you need it most. Voltage/frequency (V/Hz): 120/60, 6.5 amps. Noise level: 51.5 dB. Length of exhaust hose/pipe (feet): 4.25. Compressor type: Reciprocating. Room thermostat. Anti-freezing function. Two-speed fan control with protective dust cover makes operation simple. Timer bypass switch. Fan motor protection and a double condenser. On light indicator. Wheels. Weight: 97 lbs. Warranty: 1 year parts and labor. 5 years on compressor/sealed system (parts only). Set-up took only 5 minutes in my attic bedroom. The exhaust tube/window sash adaptor was simple to install, but I would suggest you plan to supplement its temporary installation with some weather-stripping. This rolling unit is solid, and the controls are convenient and easy to operate. Adequately cooled a 90 degree room in about 2 hours and kept it comfortable afterwards. Adjustment of the thermostat is simple (twist a knob). I agree with another reviewer that the exhaust tube gets warm, but this is to be expected given the unit's mechanism of action. I don't see it as an issue. The enclosed instruction manual is sparse but covers the basics. Reads like a translation from Italian (which it is). This unit works well enough and the layout and features suggest that some careful design went into this unit. The buttons are guarded by posts and the thermostat control is recessed to guard it, yet is very accessible by a thumbwheel in a recessed area. The timer appears to be a precision element driven by a synchronous clock motor for an easy to understand setting. A cover nicely slides over it to protect it from dust and damage. The intake for the cooling coils has a nice filter that fits snuggly to prevent dirty air from bypassing it. It is pretty quiet for a unit with all the working parts inside the room. The hose and window bracket worked perfectly for my horizontally sliding window. The cooling effect is about what you would expect from a 7,500 BTU/hr unit operated with the noted inefficiencies. One inefficiency, though minor, is the hot ununsulated flexible hose that expels the heated air. It is like a radiator. I positioned the unit to be as close to the window as possible for shortest hose extention. Applying wrap-around insulation will address this detail. After many hours of operation, the lower steel panels are only slightly above room temperature, indicating that the hot components are well insulated. The finish level and physical contours, along with the thoughtful handling of the controls and markings, make this a nice unit. The lifting handles are properly contoured and fit very well into the steel panels, allowing me to lift this unit 2 stories. This unit takes room air for cooling the hot coils and expels though the single hose. As such, this unit will cause the room to pull in air from other rooms or leakages to make up for the air forced to the outside. This design, in effect, has the equivalent of an air exchanger active even if via a different manner from normal A/Cs. Better is if the condenser coils are larger to allow proper cooling using another hose to take cooling air from the outside air as with regular air conditioners to avoid air mixing and increase cooling. 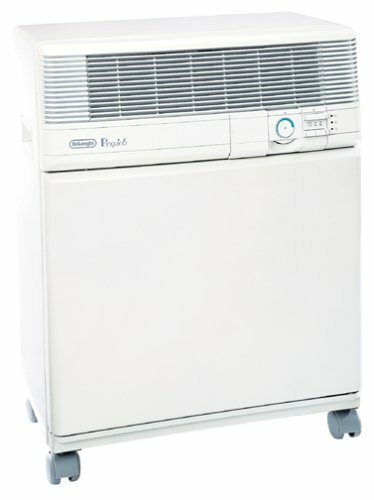 This unit is best used when operated in a home in which other rooms are already cooled.